You know you need a new fence. And you know you hate painting and staining. So, you made the obvious choice: a Vinyl Fence. These fences are not only incredibly attractive, instantly improving your Manassas home’s curb appeal, but they are also incredibly durable and, most importantly, incredibly low maintenance. That’s what we like to call a win-win! Now all you have to do is find the right fence company in Manassas. And that’s easy! For more than 50 years, Hercules Fence has been providing exceptional fence services to the people of Manassas and the surrounding area. Our experienced sales and installation staff at Hercules Fence can handle any of your fencing needs. Hercules Fence is also the largest fence company based in Northern Virginia, affording us the luxury of purchasing the fence you want at a price you will love. We pride ourselves on installing high quality fences at affordable prices. These fences look good. Period. With their clean appearance, a vinyl fence will instantly add to your home’s curb appeal. This is great while you own the home, but will be even more beneficial when you finally decide to sell. Improved curb appeal not only makes your home easier to sell, it can also increase your home’s resale value by as much as 15-20%. Vinyl is incredibly durable. In fact, it is nearly five times as strong as wood. Wow! This makes vinyl a great choice for areas that experience extreme weather conditions, like strong winds and rain. Vinyl is also very low maintenance. Unlike wood, you will never have to paint or stain your vinyl fence. Just grab a hose and give it an occasional rinse to restore its shimmer and shine! 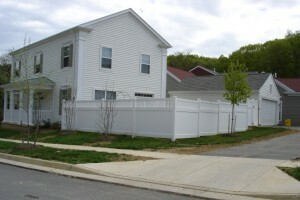 Interested in a Vinyl Fence? Please contact Hercules Fence of Manassas, Virginia by calling (703) 551-2609 or visiting our website. You can also follow Hercules Fence on Facebook, Twitter, Google+ and YouTube! This entry was posted on Wednesday, July 30th, 2014 at 3:08 pm. Both comments and pings are currently closed.